LEN - www.lankaenews.com | Envoys of 25 countries express their solidarity with Ranil..! Not even a congratulatory message to conspirator MR..! 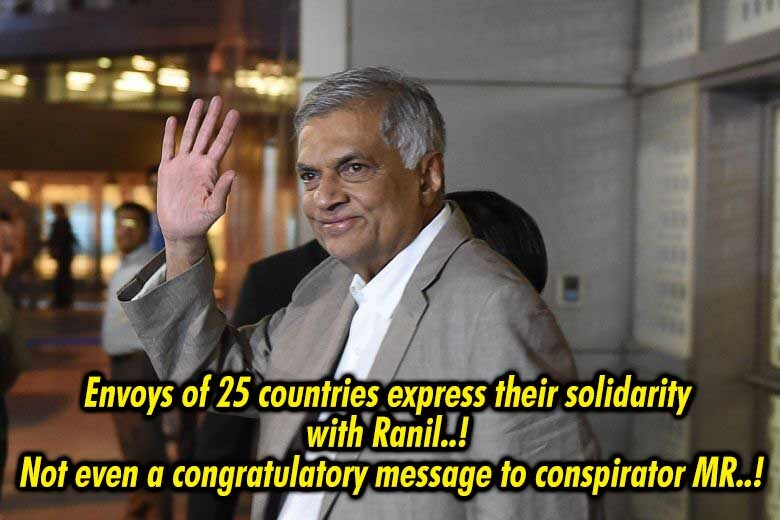 Envoys of 25 countries express their solidarity with Ranil..! Not even a congratulatory message to conspirator MR..! (Lanka e News -27.Oct.2018, 11.30PM) Envoys of 25 countries who assembled at temple Trees said in one voice , they will lend all the support to safeguard Democracy when they met prime minister Ranil Wickremesinghe. When the Envoys of 25 leading countries including US UK, those countries of the European Union ,as well as India and Pakistan met at temple Trees at the invitation of P.M. on 27 th , the latter explained to them the constitutional violation committed by the incumbent president . The P.M. who elucidated the reforms introduced by the UNF government including himself towards Democracy and reconciliation said , there is much more in the pipeline in that direction. Hence while all this is in progress ,the president appointing another individual as a prime minister is illegal , the P.M. pointed out. While it has been proved by the failed no confidence motion which was brought against him that he has the majority support ,this anti Democratic action has been resorted to. Hence the P.M. requested the foreign envoys to assist him to re convene parliament which has been adjourned, in order to enable him to prove his majority support and to safeguard Democratic parliamentary traditions. Every Envoy without exception confirmed that they will do everything to strengthen country’s Democracy, and they will keep a watch on all activities which run counter to it. They also confirmed that they still recognize Ranil Wickremesinghe as the prime minister.